I haven't done a haul post in a really long time, well it's a long time for me anyway, because I haven't really hauled anything the past month except a few things that I'm gonna mention in this post, so unfortunately this is going to be a small one. Anyway let's start. First of all I got a few things from The Body Shop, because they had a 20% off, so I decided to try a few products from their Aloe skincare line, which I wanted to try for really a long time. I got the Aloe Soothing Day Cream, which is a very good hydrating day cream. I've been testing it out for about a week now, and I have to say that it's a little too hydrating for me, because my face do get shiny right after I apply it. I really like it as a night cream or when I don't have to use make up that day, because it can be heavy underneath foundation. In my opinion it's a great day cream for those who have more of a normal to combination skintype, otherwise it can be a great night cream. I also got the Aloe Calming Toner, I've used it only a couple of times but I'm really impressed, it's very cooling and soothing on my skin, and it's also hydrating, so whenever I don't feel like using a moisturizer I can just use this one. I'm not a toner person, for many years I've been purchasing only one toner, the Clinque Clarifying Lotion #2, but I don't use it all over my face, I use it only as a treatment on pimples whenever I break out, because it's very strong and contains alcohol. It's nice that I've found a toner that gives a cooling sensation on my face without drying it out. One more thing that I got from The Body Shop was a Born Lippy in Raspberry, I don't know what possesed me in purchasing it, maybe I felt really nostalgic because it used to be my HG lip balm when I was a teenager many years ago. 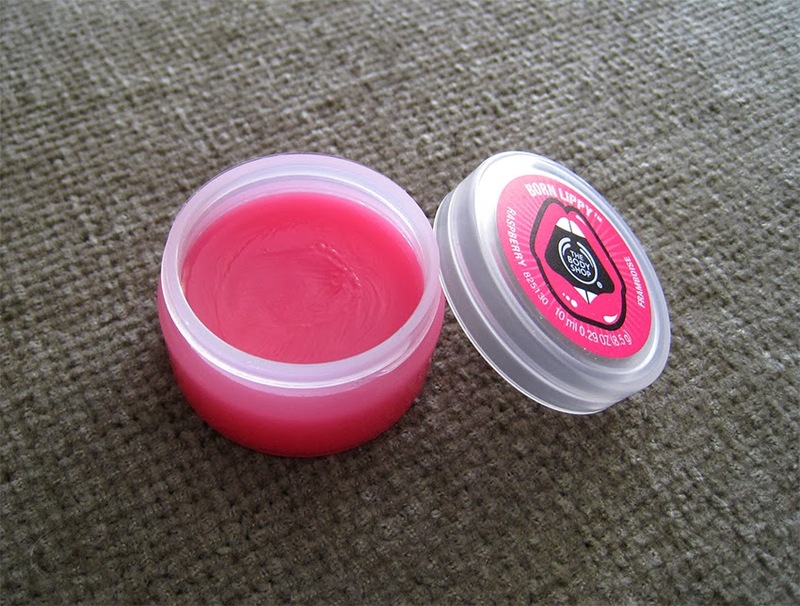 It's a gel type of lip balm which is very glossy on the lips, it's not the most hydrating lip balm I've ever tried but I really like it and I think I will use it a lot in the summertime because the taste and texture screams summer to me. 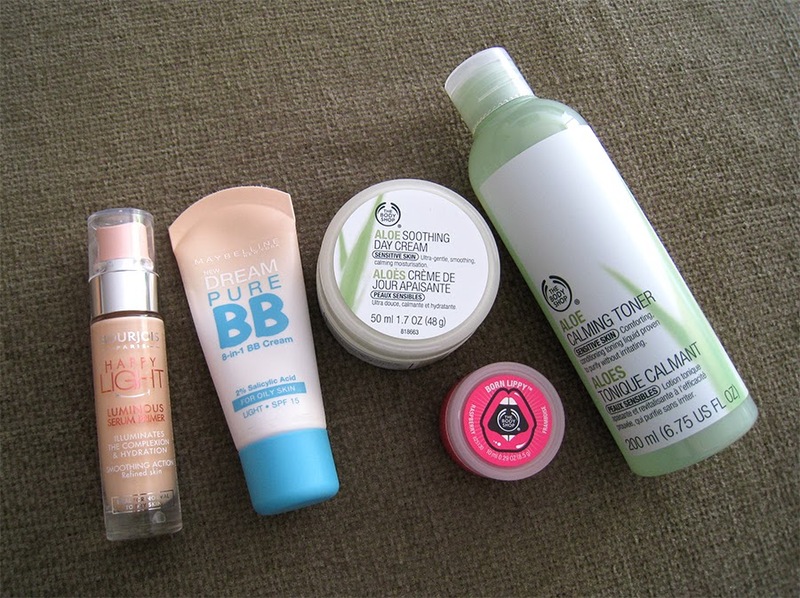 From the drugstore I got a BB cream which is very strange for me because I never use BB creams. 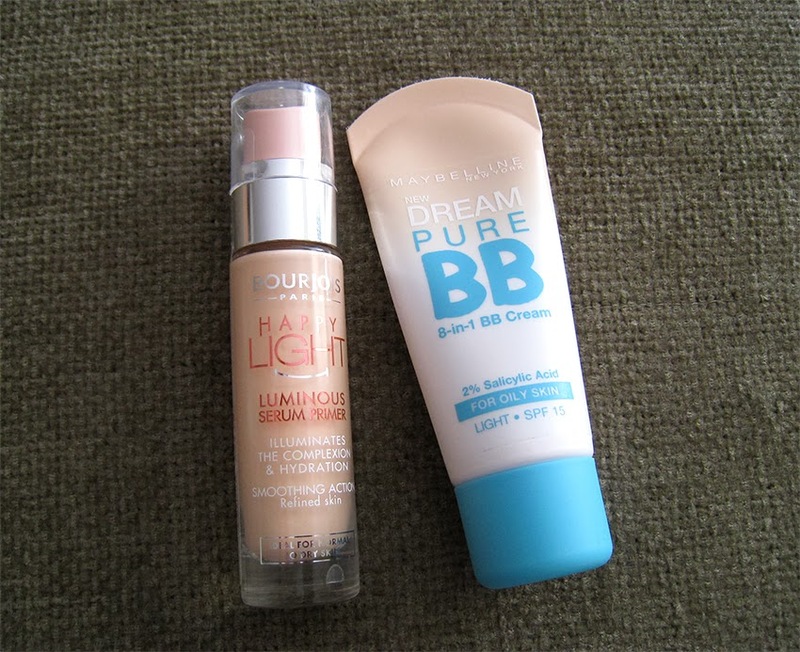 I got the Maybelline Dream Pure BB Cream for oily skin, which also contains 2% Salicylic Acid. I'm not an expert in BB creams so I went for a drugstore one that it's also good for oily skins, I remember that I purchased the Garnier BB cream for oily skins a long time ago, but I didn't really have the chance to try it more than a couple of times just because I didn't really like it back then, well actually I didn't like BB creams at all, so I must have thrown it away, but I really wanna retry it in the future. So back to the Maybelline one, it has a really nice texture, it's not liquidy like the Garnier one, it's more of a a creamy one, and the Light shade has pinky-beige undertones but it adapts to the skintone really well. I love how fresh it makes my skin looks, but I have one problem, it gets shiny really fast, I mean within an hour. I don't mind blotting my face, I'm used to it anyway, but it will get shiny again within half an hour and I have to repeat the blotting process again and again, so I don't really recommend it for oily skins. I will do a full review in the future if you want me to. A few weeks ago I purchased from Asos, the Bourjois Happy Light Luminous Primer for only 10 euros, here in Greece it costs 15 euros so it was a good deal. After I received it I realised that it contains only 15 ml of product which is half the amount of what other primers contain, so in my opinion this is a very expensive drugstore/high street primer. I got the Luminous primer because I didn't read the best reviews about the matt one, and everyone keep raving about the luminous. So far I've tried it three times and I never thought that I would like it that much, I'm really impressed because even though it says luminous it doesn't make my face look shiny or oily at all even after many hours of wearing it. Don't expect it to be like a liquid highlighter because it's not, I can't see any illuminating effect on my skin, but right after I apply the foundation on top I can see a difference on how my face looks, it looks more awake and the foundation just sticks to it really good and it lasts for hours! I think that everyone should try it, especially the ones that don't wear primers , because I'm not a primer person either but this one just changed my mind. Well that's everything that I hauled, I hope you liked it. Let me know if you've tried any of these products, or if you want to try any of them in the future. Thanks hun! Yeah definitely try the Aloe range if you have drier skin, they're really good for sensitive skintypes, and I also read really good reviews about the night cream. Yeah I know, the Garnier one is definitely more matte, the Maybelline is more for combination skintypes. It's really good, you should definitely try it! Με γεια! Η σειρά με την αλόη πρέπει να είναι φοβερή! The Maybelline BB Cream was really bad on my skin, hope it works better on you! 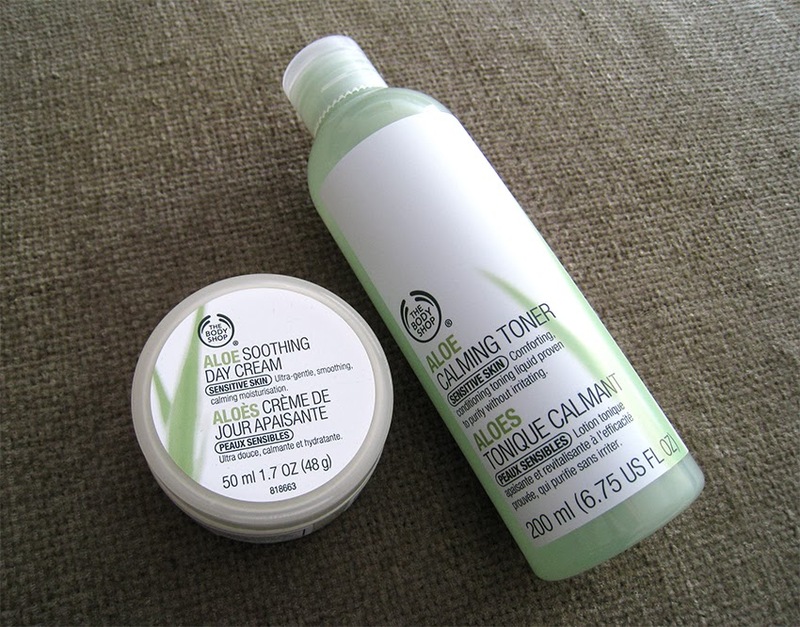 I love The Body Shop products and have many of them but I have never tried the Aloe Series! Enjoy them! I am following you on GFC. Kisses! Θα κανω ενα review οταν θα το εχω δοκιμασει καμποσο καιρο να ειμαι σιγουρη, αλλα εως τωρα πιστευω οτι ειναι πολυ καλο! Με γεια όλα Σοφία μου! Την ΒΒ αυτή τη λατρεύω, είναι η μόνη τόσο ανοιχτόχρωμη που να μην πορτοκαλίζει - αν και λίγο πιο ανοιχτή να ήταν, ακόμα καλύτερα! Αν κ μου ειναι λιγο ανοιχτοχρωμη, συμφωνω μαζι σου, εχει μια πιο neutral αποχρωση χωρις να κιτρινιζει η να πορτοκαλιζει.